The easier you make your cleaning routines or any routine, the more likely you will be successful at this long-term. The idea of cleaning is to remove the dirt and germs from our homes and constantly cleaning isn’t always the best way, you have to find the balance between cleaning your home and living. Sometimes finding this balance is the most difficult of tasks, but there are things that you can do which help this process without the worry and the stress, it is easy to get caught up in the cleaning or the guilt for not cleaning enough when you should think about getting the balance right. Having the best way to find that balance is to look at your current situation, do you feel that how you clean is working? Are you procrastinating when it comes to the cleaning you need to do or are you one of those people who have your routines so well-organized that you clean on automatic pilot? Do you worry that you aren’t cleaning enough or that you just can’t get your home perfectly clean? All these thoughts are OK, you don’t have to feel that you’re being judged for how you clean, sometimes you just need to tweak how you set your mind about cleaning. For those that procrastinate, you need to find ways to motivate you to clean, it is as simple as setting a timer for 5 minutes and seeing how much you can do. Sometimes, the list of tasks seems so big that it becomes overwhelming as to what you need to do and it becomes impossible to actually think you can move forward. In this case, you must break down these lists and tasks into items that you can do for short periods, if you think dusting your whole house it too much then break this down into just one room at a time. I know this is hard to deal with, I have wanted perfection all my life, yet I never felt that I have come anywhere near close. I always felt my best wasn’t good enough and that has transferred into how I see my home too. I wanted perfection with my cleaning and for years, I wouldn’t let anyone help me because they just didn’t do the task right. To me it didn’t matter they were helping, what mattered was the result and if it didn’t meet my standards I did it again. I still struggle with the need for perfection but I am more open to other people helping me and I am getting better at thanking them for their help even if they didn’t do a perfect job. The idea of cleaning to perfection just isn’t possible and any form of cleaning is good enough, it might just take away some of the dirt, but that means that there is less dirt to clean next time. You have to accept that any cleaning is good, the more other people can help does give you more time for the other things in your life. If you want to remove the dirt and germs from your home you might want to think about reducing the dirt that comes into your home. The less that you allow to enter your home, the less you have to clean. Removing outside shoes at the door will reduce the amount of dirt that enters the home. Having doormats on the outside and the inside will trap the dirt at the entrance and prevent it from being spread around your home. Wiping animal’s feet before they enter your home, this reduces the amount of dirt that your pets bring into your home. Fly screens on your doors and windows will reduce the amount of dust that is able to enter your home. These are just a few ways you can reduce the dirt that enters your home. The less that’s brought in, the less that you will have to clean. It might seem like an odd thing to say, but the more that you clean the easier it is to clean and there is less dirt built up meaning that it will take less time. By creating regular cleaning schedules, or times in the day that you tackle cleaning, the quicker these cleaning sessions will become, this is due to the area being relatively clean because you haven’t left it for long periods between cleaning. The more frequently you clean the less there is to clean and the tasks become easier and faster to accomplish. This is why I like to clean daily, quick breaks between working means that I am keeping on top of the cleaning and I don’t spend more than 5 minutes at a time cleaning. If you work outside the home, you will have to adjust the timing, but the principal is the same, it could be as quick as the adverts on the TV to use as your cleaning time in the evening, or whilst you are making your evening meal to spend the time catching up with the washing-up. You are not striving for perfection, just a few minutes at a time to tackle the cleaning. Therefore, if you are looking to remove the dirt from your home the easy way, then you might need to think about how the dirt enters your home and how often you tackle your cleaning. They both have an effect on reducing the dirt and germs in your home. What is your best tip to remove the dirt from your home? 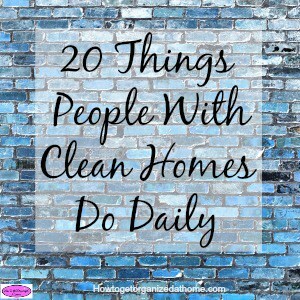 I wrote another article that I think you might like, 20 Things People With Clean Homes Do Daily.